When Kamala Harris, one of the early frontrunners for the 2020 Democratic nomination, talked about the importance of the university she attended, she shone a spotlight on historically black colleges and universities (HBCUs). 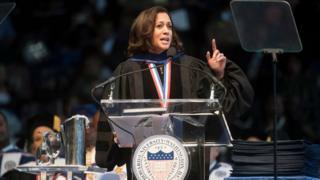 "When the federal government gives attention to HBCUs we end up having a profound impact on black people in America," said the California senator, when asked about her alma mater, Howard University, in an interview following the launch of her presidential bid. HBCUs like Howard, one of the top ranked and most well known historically black universities in the country, are recognised around the globe. Dr Gracie Lawson-Borders, dean of Howard's school of communications, says that for a lot of the students "this opportunity to be accepted at Howard, at Bennett or at any HBCU is just a part of their growing war chest of preparation to make a difference in this world". Why did the US need HBCUs? Historically black colleges and universities, commonly called HBCUs, were created to provide higher education to disenfranchised African Americans in the United States, who were otherwise prohibited from attending most colleges. The first and oldest HBCU, Cheyney University, was founded in 1837 in Pennsylvania. At the time, Blacks were not allowed to attend most colleges and postsecondary institutions, as a result of slavery and segregation. Under the 1965 Higher Education Act, HBCUs were officially defined as institutions of higher learning that were accredited and established before 1964. The act allocated federal grants and funding to those colleges and universities. These institutions would become largely responsible for the black middle class composed of doctors, lawyers, teachers, engineers and other professionals. HBCUs continue to produce black celebrities, professionals, and leaders. The two oldest HBCU medical schools Meharry Medical College and Howard University are responsible for more than 80% of African American doctors and dentists practicing in the US today, according to the US Department of Education. Notable African American alum - like Senator Kamala Harris - aren't far and few. The long list of successful African Americans who attended HBCUs include civil rights leader Martin Luther King, the first African American US Supreme Court Justice Thurgood Marshall, media mogul Oprah Winfrey and director Spike Lee - to name a few. Why have HBCUs been in the news recently? Bennett College, founded in 1873, made headlines in recent months after the Southern Association of Colleges and Schools Commission on Colleges voted to revoke its accreditation due to financial instability. The university was then faced with a task of raising $5m (£3.8m) by February or permanently closing its doors, leaving only its legacy. Bennett College launched the campaign #StandWithBennett and surpassed their goal by February, raising more than $8.5m(£6.5m). Bennett College is one of 101 HBCUs, but its struggle to maintain accreditation is not unprecedented. While some HBCUs continue to thrive, others struggle risk accreditation and enrolment. In fact, five have closed completely since 1989. While the initial mission was focused on educating marginalised African Americans, today these colleges are comprised of all demographics. As of 2016, non-black students made up 23% of enrolment at HBCUs. Still, historically black institutions are considered safe-havens for African Americans. Many students at Howard, founded in 1867, say that HBCUs are one of the only places that transcend racism still prevalent in society. "It is necessary to hone in on black spaces where we can thrive, support and reach each other before stepping out into a society ruled by racism and built on keeping black people in last place," says Autasia Ramos, a recent graduate of Howard University. The lack of barriers allow students to learn about their history, see their potential through the lens of other successful African Americans who have come before them, and become resilient in a society that still struggles to appreciate them. Mara Peoples, Howard's student body vice-president who met Ms Harris when she launched her presidential bid, points to the California senator as an example of how HBCUs foster that potential. "I feel that I've found validation in myself going to an HBCU because I am able to learn more about my background and I have more opportunities that are geared toward me, as a black individual," she says. Professor Jennifer Thomas, an alumna of Howard University, who now teaches at the school, says she would not be where she is without the education she received at Howard. "The classes were rigorous, the professors were experienced, but most of all I felt I was in a nurturing environment with people who were committed to my success." Supporters of HBCUs say they are not only important for African Americans, but for all of society. Mark McCluskey, a white student at Howard, says for the first time in his life he is considered a minority, but shares his peers' sentiment about the value of preserving HBCUs. "HBCUs are really relevant in today's society because they can spread a lot of knowledge about the cultures that America has largely ignored over the past couple of centuries."